Let me just say that this is one of the best books I think any small or large business owner or marketer can buy – with one caveat. You need to be selling a specific product, for a specific problem. If you have an online jewelry store, or a marketplace of sporting goods, this will be harder for you to apply. While it’s not explicitly mentioned in the book, it is essentially designed for people selling digital products, educational products, coaching, and similar services. But if you have a set of products that are connected to a similar set of problems, you can still use these principles. So what does this book do for you? In short, it helps you write a sales page for your website. However, the principles and techniques translate to a number of different mediums including phone pitches, direct mail, email marketing, and more. Let’s just say this book is extremely well put together. It’s short, about 160 pages, and structured with specific action steps. I literally started taking action from this book for work, for my side projects, for emails I was writing, and opened it numerous times to reference back to sections, especially the part on bullet point templates. Copywriting is all about giving light to problems, solutions, and creating curiosity. If you show you know their problem, illustrate that it is a serious problem, and provide a trusted solution that works, to get them a desired transformation while reducing the risk. You’ve got them. 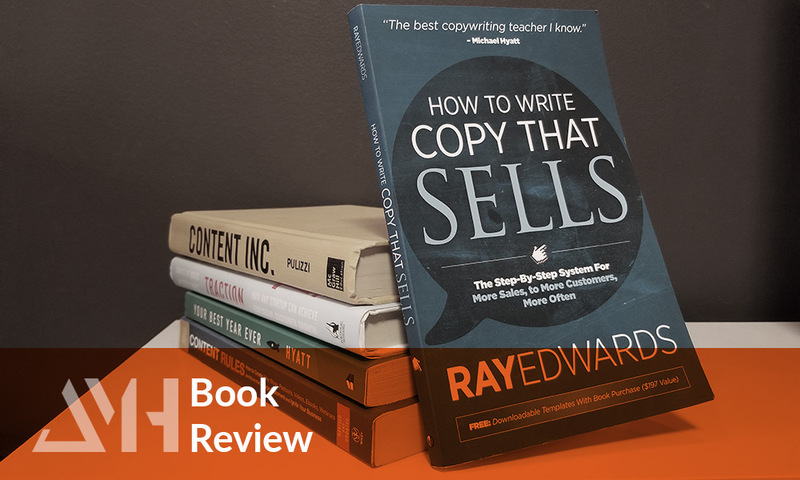 Create a “Copy Thesis” to start at simplicity – “Any [Your Audience] can [Solve Their Problem] by using [Your Product], because [How it Solves the Problem]. Money-back guarantees are essential to the “risk reversal process”. This is your opportunity to show your confidence in your product, and also reduce their risk in giving you the money. Be creative with it, it’s a way you can stand out. Email marketing is still one of the best ways to connect with people and sell your products. You can create sequences to launch products, offer promotions, offer post-sale follow ups, and just build rapport or good karma. Subject line and headline writing, it’s your first line of attraction, offer some angle that is out of the ordinary, is personalized to a problem, and creates curiosity. The bullet point method: Write at least 105 bullet points that would sell your product, choose the best ones to use in your sales copy. This is easy with the included 21 different templates, write 5 on each and you’re done! Some of these are kind of “Click-baity” but it gets your brain firing in a way that’s addressing problems and creating curiosity at the same time. Example: The If-Then Bullet – “If you can send or receive email, then you can learn to make stock trades online in total safety” (The idea is that you say something simple they can obviously do, and relate it to the ease of your solution). The Dominant Story Idea – You should be able to sum up the idea of your advertisement or copy into one sentence.